As gardeners, we tend to focus on plants, using color, texture and form to accentuate our landscapes. But, there are a lot of things we can do with recycled household items to add color and texture too. As I scrolled through Pinterest, I recently came across beautiful mosaic garden features and was inspired to create something new for my garden this spring. Designs can be floral with a variety of colors like these from artist Shelley Huff. Photos by Wendy Hanson Mazet, Cooperative Extension. 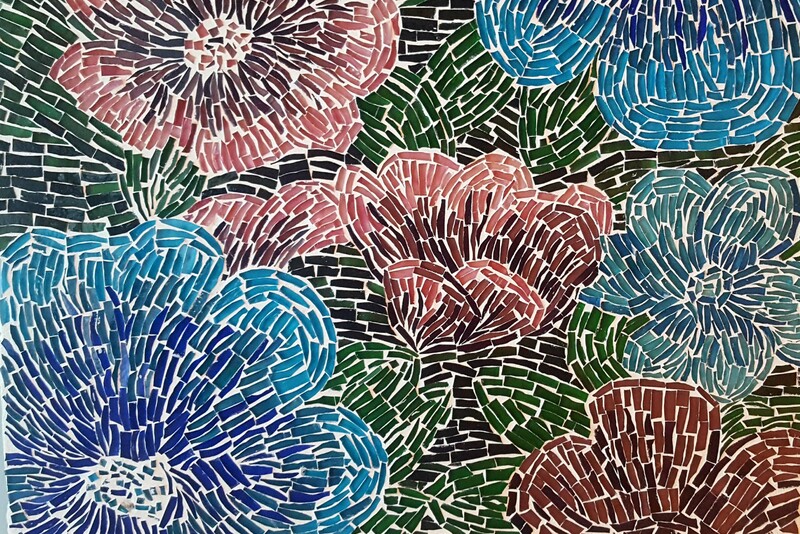 Mosaic designs can be intricate or simple, expensive or cost-saving, and colorful or monochromatic. You can create a few stepping stones for your landscape, design entire hardscaped areas with mosaics or include garden features such as globes, mushrooms, bird baths or wind chimes. When deciding what to create, imagine your landscape with its current plants in spring, summer and fall. Think about the colors, textures and forms you see. This might be hard with your current defoliated, dormant landscape, but if you have photos from last year, you can start to see trends. Notice areas where your landscape is missing color, or where you’d like to see contrasting colors to add design to the area. Think about adding function. You might want a small garden table and chairs for a garden viewing area, or maybe you need a path for strolling through a section of your garden. You can add a mosaic design to a table and chair set to create a pop of color. Once you know what you want to make and where you want to put it, you’ll need to decide the materials for your mosaic piece. To save money, try using broken garden pots or dishes from your kitchen. You can also visit your local thrift store and search for inexpensive ceramic items in the colors you like. To save even more money, pick up rocks on your next hike in the Sierra Nevada Mountains. You can find rocks of various colors and textures to incorporate into your design. If you don’t mind spending a bit of money, visit your local craft store or garden center and look for materials to use. These can include glass pieces, colorful stones, tiles or other items you find. Some people even add words or phrases to their mosaic piece. This can be a fun way to add a sense of place to an area of your landscape. The last thing to do is purchase the rest of your supplies and make your mosaic masterpiece. Some items needed to complete your design include sandpaper, wire brush, safety glasses, hammer, thinset mortar, acrylic admix, sponge and old clothes and towels, in case you make a mess. You can find tutorials online for making mosaics with mortar as well as other materials. 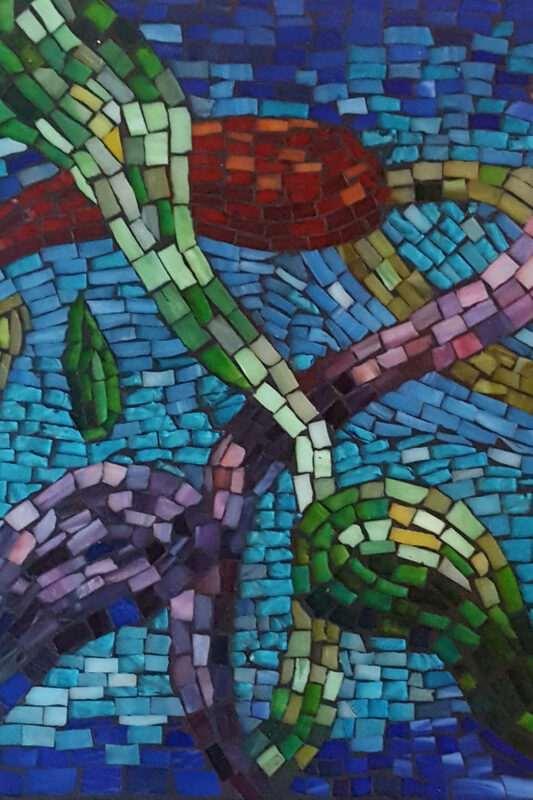 Follow these instructions for making your own mosaic garden piece. When you are done, don’t forget to seal your piece, especially if you plan to add water or keep the piece outside during the winter. This will ensure your mosaic piece holds up for years to come. So while you are stuck inside this spring, why not create a fun mosaic garden decoration? Jenn Fisher is the Commercial Horticulture Program coordinator with University of Nevada Cooperative Extension. Gardening questions? Contact a Master Gardener at 775-336-0265 or mastergardeners@unce.unr.edu.